If you follow me on Twitter (hint, hint), you already know that I’m pretty into (read: very into) the bar and restaurant scene here in Chicago. I often get asked — by locals and tourists alike — about where I’ve been recently and if I have any recommendations (to which the answer is always ‘yes’). Problem is, I’m not made of money (big duh, right?) and keeping up with the scene in this town is expensive, not to mention nearly impossible at the rate in which new places keep popping up. So it’s no surprise that I always geek out over a deal. Uber (you know — the Uber) understands that excitement, which is why — to celebrate the launch of uberX, their rideshare* offering here in Chicago — they’re partnering with over 100 of the city’s hottest spots to offer awesome deals and free stuff to riders. 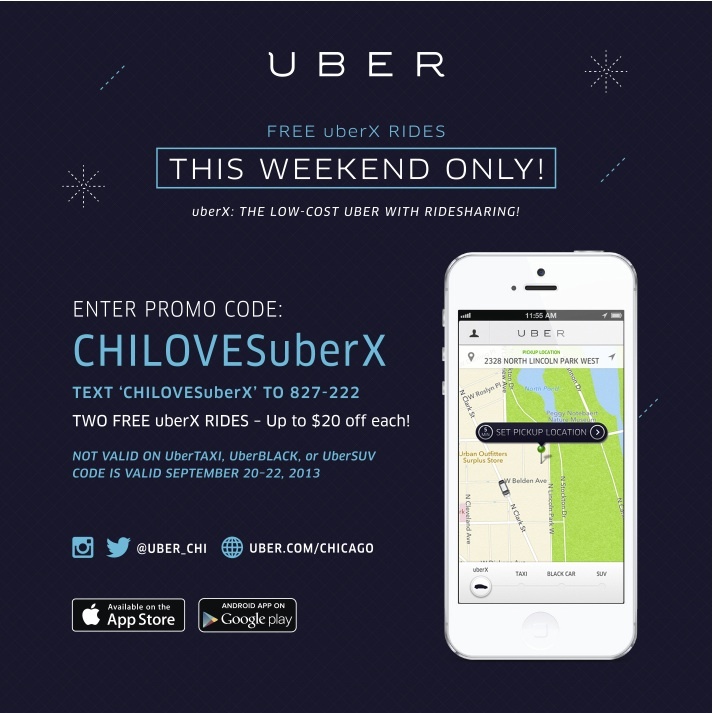 They’re even giving away two free uberX rides TO EVERYONE IN CHICAGO (up to $20 each). Sweet, right? So yeah, you guys. Uber is definitely hooking it up this weekend. Learn more about the promotion and the participating Chicago businesses on Uber’s website. *What is ridesharing, you ask? According to Uber, “uberX is our low-cost option with ridesharing that’s better, faster and cheaper than a taxi. On uberX, you’ll find everyday people driving their own cars. All drivers pass our rigorous screening process.” For more on uberX ridesharing, visit the uber Chicago website. **This was an unpaid post. Uber reached out to me about their promotion and I chose to cover it because I found it worthwhile. Use this link to sign up and get $10 free cash towards your first ride. On top of the 2, $20 free UberX rides this weekend.